Okay, so I didn't get to go to Quilt Festival in Houston. Never fear though, it is on my list of things to do in the hopefully near future. 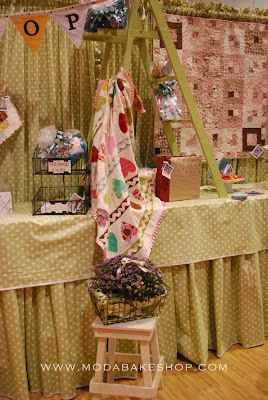 I did however, happen to have a quilt at Festival. 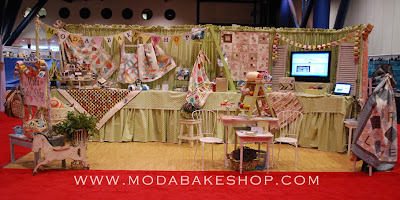 I was so excited when the Moda Bake Shop asked if they could use my quilt to display at their booth. I still get a little peppy whenever I think about it. 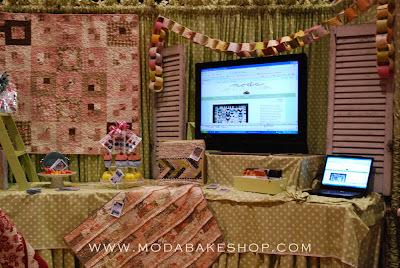 We'll just imagine the peppy little dance I did when I saw these pictures over at the Moda Bake Shop. How exciting and rewarding...I only hope one day to be as talented as you are...and still have fun with it!!! Your quilt is front and center girl! Way to go. Love it.